11/10 William Lyall Farquarson sadly passed away on 20th September. He was the last station commander at Worksop with 4FTS. My thoughts go out to his family and friends. An obituary should appear in The Telegraph soon. 04/09 sad to report Air Commodore and former 211 AFS Wing Commander James Coward died on the 25th August full obituary at http://www.telegraph.co.uk/news/obituaries/military-obituaries/air-force-obituaries/9515967/Air-Commodore-James-Coward.html. 21/06 Sad to report the death of Laurie Adlington this week. His funeral is at the Isle of Wight Crematoria on Friday 22/06/12. Rest in peace. This project initally started as a magazine article for Worksop Life magazine and spiralled out of control! If you served at RAF Worksop or have any information on the airbase/aircraft or personnel please e-mail us at rafworksop@ymail.com or follow us on Twitter @RAFWorksop. We'd also love pictures of the base/personnel/aircraft too. Meteor F.8 WK864 served at RAF Worksop with 616 RAuxAF. This photo is of WL168 repainted as WK864 at Elvington. It is doubtful the aircraft served at Worksop in this colour scheme, as by the mid 1950's the squadron was painted in high speed silver. 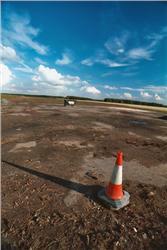 RAF Worksop during 2003 looking east towards Retford. I'll put it through Photoshop shortly to get rid of the 'drunk' sky!